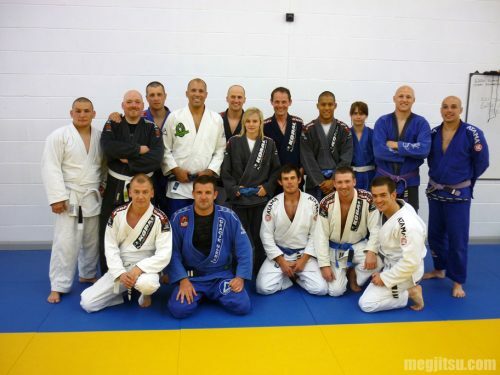 Last night’s Royce Gracie Seminar was marvelous. Over the course of several hours we built up a flow of techniques from take down, to mount, to transition between chokes, arm bars, more chokes and more arm bars. In contrast to seminars by some elite martial artists that I have attended (inside and outside of BJJ), the evening’s work concentrated on bread-and-butter work; less about flash, more about smash. While the whole range of skill levels that attended the seminar could handle the drills, there was a lot of technical finesse that more advanced attendees could benefit from. This was seriously refreshing and impressive to me. There was no attempt to ‘sell’ the art, we worked very much in the way we do in regular training at Dartford BJJ, both in terms of working through a logical sequence of techniques and building up a drill from standing to ground and where we failed to grasp a technical aspect of the drill, we were corrected by the giants that are Royce Gracie and Marc Walder. A big thanks to Marc, too, for putting together such a superb evening. His humility, skill and love for the game are an inspiration. We started with the body-fold take down to land in mount, moving to an arm triangle. If the choke wasn’t happening we switched to control the wrist as from a side-mount, collapsed the opponent’s arms, used the body to roll them to their belly to end with an RNC. Where the opponent resisted having the arms collapsed to allow us to take the back, we moved to a figure-four grip in order to transition to an arm bar. Where the opponent defended the arm bar, we switched to a two-onto-one grip on the opponent’s wrist/forearm, used the body to roll the opponent forward and then back, slipping the hooks to move to an RNC. If the opponent then leant forward to frustrate the RNC, we moved to the opponent’s side in order to drop to our shoulder, swing the leg around to move to a seated position in preparation for an arm bar. As the opponent defended the arm bar, we used the free hand to place our shin on the ‘X’ made by the opponent’s defending wrists, triangled the legs to pop the arms open and finish with the arm bar. During the evening we would work a new section of the drill in isolation and then put it all together from standing. Royce was the first BJJ star I ever met. Actually before I ever trained BJJ – way back in 2002 I think (he turned up my kickboxing club). He seemed very humble and lovely back then and nice to know he still is. I finally got the chance to attend a Royce seminar in 2005 and have attended about half a dozen more since (I met Sooz at one of them!). Royce has gotten some stick recently on the various forums, but if you look at his heritage and what he has achieved, he will always be remembered as the man who's UFC wins helped bring BJJ to the wider world. We should all be grateful. To anyone who criticises Royce, I always reply by saying this: you roll with Royce and tell me if you think he is too old skool? I think you'll find, once you recover from excessive tapping, that the man is still relevant and has much to offer us. Look out for Matt Benyon's forthcoming tribute to Royce in Fighters Only soon. He looks great in your photos, glad you took a lot away from the seminar. Where you allowed to take pics/vids of the technical section? Thanks for your enthusiasm, Part Time Grappler, I appreciate you taking the time to read and comment. There was a photographer there working with Royce (I believe) and I didn't ask if it was possible to take pix during the seminar. However, spectators were allowed, so it wasn't on lock down. I'd defo ask if you're interested. Enjoy! Out of interest, was he still wearing a blue belt, and does he still hand out lots of blue belts at seminars?